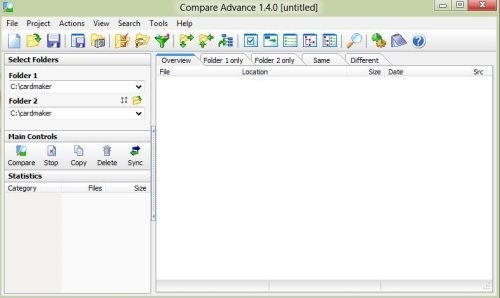 Compare Advance is a free tool to compare two folders, synchronize files, back up all files and folders in Windows 8 PC. This folder comparison tool is very effective and efficient when you need to back up and synchronize files in Windows 8 PC. Compare Advance consist three main stimulating functions are compare, synchronize and backup. Compare function allows to compare between two folder on your hard drive, or over any removable media or network and easily shows the difference between two folders. You can also synchronize files on Windows PC or laptop. First of all, compare two folders then solve the issue with advanced synchronization. After all this, there would be a doubt of important files. So you need to backup all your files to the destination of your choice. You can also see a new built-in feature called “Archive Folder Filtering” which allows to save space on your hard disk. Includes specific sub folders while selecting the main folders. Provides summary about the differences and similarities between two folders. Ability to sort file according to the header captions. Error notification and detailed log info. Ability to compare between zip files and disk folders. Use check boxes to include or exclude the options. Do not miss out DropZone for Windows 8 reviewed by us. Head over the link to download Compare Advance on your Windows 8 PC. Install the downloaded file on Windows 8 PC. Follow further step to complete the installation. Compare Advance is an excellent tool to compare files, synchronize files, and backup files. You should definitely give a trial to it.